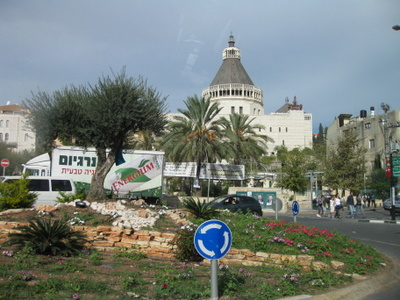 Today we visited the Basilica of the Annunciation. It’s a magnificent Church, rebuilt in the late 60s, on the spot traditionally believed to be where the Angel Gabriel appeared to Mary. At these holy sites, I find myself not so much recognizing the religious or spiritual significance of what is here, but appreciating what has been built to commemorate it. It’s hard to kind of wrap your head around the idea that, “Hey, this may be where the Angel appeared to Mary!” I believe it’s an appreciation that needs to ferment for a bit…. Let it sit, let it get a little richer…. Pull it out come Advent, or a Marian feast day and see where I am with it. In the meantime, let me turn to immediate impressions. What catches my eye at this site is the exterior of the Church. Surrounding the Basilica are dozens of mosaics depicting our Blessed Mother, donated by different countries. Many are very colourful and very beautiful! 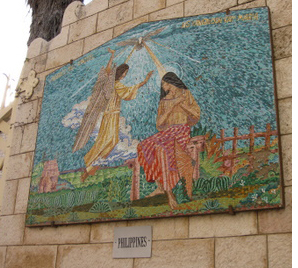 One of the mosaics has Pope Paul VI – likely donated when he visited the Holy Land in the 60s. One of the most impressive ones was one from the Philippines which depicts the Annunciation. As Gabriel descends, we see a humble Mary, dressed in an outfit more familiar to the Philippines. At least six feet wide and positioned by the entrace gate it lights up the courtyard. The mosiacs are further evidence of our love for the Blessed Mother! I was also taken aback by the Salve Regina inscribed, in Latin of course, on an entire exterior Basilica wall. 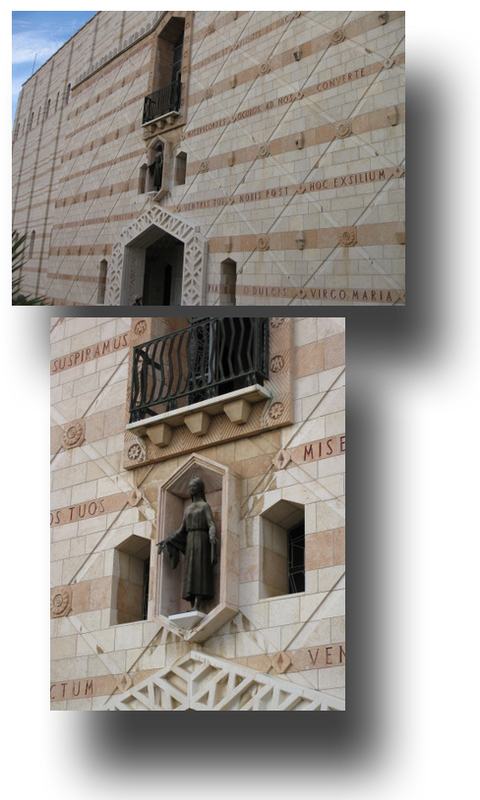 In the center of the wall was a statue of our Blessed Mother, her hands outstretched. Looking at her pose, I smiled, “Be it done unto me according to your word." As one studies her, looking at those hands... it's as if she is welcoming us, her children, from all the countries of the world, into her arms.